This collection celebrates the radiance of the enlightened heart as it shines through the world’s cultures and religious traditions. 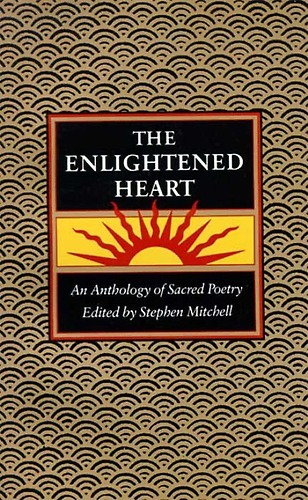 Beginning with selections from the earliest sacred masterpieces — the Upanishads and the Book of Psalms (in new translations by the editor) — The Enlightened Heart also contains poems by the Taoist and Buddhist masters; Rumi and other Sufi masters; Christian poets such as Francis of Assisi, Dante, and George Herbert; Blake, Whitman, Emily Dickinson, Rilke, and other modern poets. This unique and inspiring anthology is a record of the highest points of human experience. “We dance round in a ring and suppose, / But the Secret sits in the middle and knows,” Robert Frost wrote, looking in from the outside. Looking out from the inside, Chuang-tzu wrote, “When we understand, we are at the center of the circle, and there we sit while Yes and No chase each other around the circumference.” This anonymous center—which is called God in Jewish, Christian, and Moslem cultures, and Tao, Self, or Buddha in the great Eastern Traditions—is the realest of realities. unreachable, yet nearer than breath, than heartbeat. grown pure and silent, merge with the formless truth. you have solved the great riddle; your heart forever is at peace. returns to its radiant, intimate, deathless source. Most of what we call religious poetry is the poetry of longing: for God, for the mother’s face. 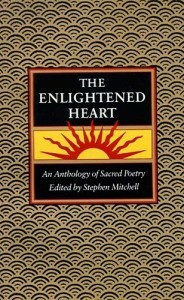 But the poems in The Enlightened Heart are poems of fulfillment. They were written by the Secret, who has many aliases. Sitting or dancing, all these poets have found themselves inside the circle—some of them a step within the circumference, some far in, some at dead center. Looking out from the center, you can talk about the circumference. But really, there is no circumference. Everyone, everything, is joyfully included. leaves the small nest of the body, goes where He wants. frightens Himself with scenes of heart-chilling terror. He returns to the blissful state from which He began. Self alternates between awakeness and dreaming. of dreamless sleep, free of desires, fear, pain. has found his heart’s fulfillment and is free of sorrow. good and evil disappear; he has passed beyond sorrow. heaven and earth are set apart. there is no yesterday, no today, no tomorrow. he is the image of you, Most High. in the sky you have made them brilliant and precious and beautiful. through whom you illuminate the night. for they will be crowned by you, Most High. from whom no living thing can escape. for the second death cannot harm them. eternity is in the now. than what we have, and long for nothing else. whose love assigns us to a lower place. so that our will is merged with God’s own will. as to the Master who appointed it. A delightful book: you can open it at any page and find a jewel, familiar or new. An elegant anthology of sacred poetry, chosen with fine taste and purpose. Stephen Mitchell’s work has always crossed religious boundaries. The Enlightened Heart continues this ecumenism by gathering together poetry from twenty-five centuries, from many cultures and spiritual traditions. Arranged chronologically from the Upanishads to Robinson Jeffers, the book seems to be Mitchell’s version of paradise: here are the fifteenth- and sixteenth-century Indian mystics Kabir and Mirabai in conversation with Shakespeare and George Herbert; the Japanese Buddhists Bunin, Gensei, and Basho talk across the continents to Angelus Silesius and Thomas Traherne; Lao-tzu and the Psalmist bow to each other; Dogen and Rumi laugh and dance. These writers have found not just “meaning” but being. There is a sense of joy, of humor, and a depth of wisdom and peace that come through.